Don't you just hate it when you accidentally drop your iPad from 100,000 feet?! "G-Form, a company well known for delivering the most extreme electronics cases and athletic pads, launched an iPad clad solely in the company's 6oz Extreme Edge case into space and then let it free-fall back to Earth." As expected, the iPad is featuring heavily at CES, or rather, accessories for the iPad are popping up everywhere. SlashGear and Engadget both reported this morning on the soon-to-be-released Guitar Apprentice from ION Audio (the people that brought us the iCade and Piano Apprentice for iPad). The idea is that keys on the $99 fretboard light up, teaching you how to play guitar and perhaps also enabling guitar games. The potential is there for this accessory to be used by iPad musicians with CoreMIDI compatible apps to play an iPad synth app for example in an iBand. We think it is a fun and creative idea for those who already have an iPad, but if you are really looking to learn guitar, we think you should get a starter electric or acoustic guitar and, if you have an iPad, get the brilliant WildChords app by Ovelin. You'll do a much better job of learning to play real guitar that way. The Adonit Writer (for the original iPad) was one of the first Kickstarter projects we remember seeing. There was quite a bit of excitement around the web when the first images of the prototype appeared with its compact Bluetooth keyboard integrated into a portfolio style case. It seemed like a long time from that first glimpse until the Writer was actually made available on general release and by the time the final production versions of the Writer were available we had moved on to the iPad 2 and the different form factor meant a new version was needed. Fortunately, we didn't have to wait too much longer for Adonit to update the Writer for the iPad 2 and it is this new version, the Writer 2, that each member of the iPad Creative team has been testing for a few weeks. As part of the testing, this whole review has been typed up with the Adonit Writer for iPad 2, using the iA Writer and SquareSpace apps. The packaging is impressive; a heavyweight end-capped box that is mostly black, with a nice product shot on the front and 'Adonit yellow' trim detail around the end-cap. This adds to the feeling of quality, a bit like an old book box. The first thing we noticed was that the box (and its contents) was quite a bit heavier than we thought it would be. In fact, the Writer 2 is really quite weighty in the hand. According to our kitchen scales the Writer 2 weighs in at 2.75lbs (1250gms). We think most of this weight comes from the sturdy construction of the steel and aluminium keyboard and the magnetic panel on the inside of the case cover. This magnetic panel is a lot larger than those used on other portfolio cases but there is a good reason for this. This is part of Adonit Writer's unique design. Where other cases use a magnet as a catch and to 'sleep' the iPad 2, Adonit have included a larger magnetic panel which does both of those things, as well as its primary function of acting as a magnetic track for the adjustable keyboard. This magnetic attraction keeps the keyboard very firmly attached to the case whether it is on your lap, a table or most other surfaces where you use your Writer 2. But it also has another very important function. Due to the clever design of the case, moving the keyboard back and forth across the magnetic section adjusts the angle of the iPad so that the screen is tilted further back as the keyboard is slid further forward. This arrangement means that the iPad, in horizontal mode, can be angled however you want without sticking to pre-defined positions. This adds an easy to adjust flexibility that in our opinion is a key selling point of the Writer. We were very impressed with the design of the Writer 2, it is obviously well thought out and easy to use once you get used to where everything is. The materials used in construction of the Writer case give it a reassuringly robust, solid feel (they also have good environmental credentials being 98% recyclable). We think the Writer would certainly live up to daily use and never gave us cause for concern as far as build quality. The cradle where you snap the iPad in holds your device very securely but it is really easy to pop the iPad out again for quick access if needed, just by applying pressure to the specific point. Adonit call this feature Quick Eject. It is a nice design touch and has obviously been carefully thought out to work the way you would expect it to. We wanted to rave about the keyboard in the Adonit Writer 2. It is, after all, the main reason why we wanted to review it in the first place. We always tell it as we see it though and unfortunately, our overall feeling is that this is a missed opportunity for Adonit. On the positive side, in use we found the keys responsive. The scissor action design means the keys spring back well and whilst typing this review we had bursts of speed that matched other keyboards we have tried, but there was a big problem, or rather, a little one. The keyboard, in our opinion, is just too small and cramped for everyday use. We are not the kind of chaps who have 'plates of meat' for hands but we found the spacing of the keys too restrictive. In fact, we think the keys are smaller and closer together than the iPad's own on-screen keyboard! In practice, nearly every paragraph of this review required us to re-type words where we had hit the wrong keys or too many keys at once. We also managed to lock the screen plenty of times by accident as the 'lock' key is just above the perhaps necessarily diminutive Delete key. This may partly be due to our incompetence, but the very tight key spacing really didn't help. We know there is limited space to work with here, and we realise that it can not of been easy to decide where to compromise in the design, but we were really disappointed with the keyboard size because we were so excited about finally getting hold of this case and it prevents us from unreservedly recommending the Adonit Writer 2. We have also got a Logitech iPad 2 keyboard case by Zagg that we reviewed a few months ago and although the Logitech is not a portfolio case, the Adonit Writer 2 keyboard feels decidedly cramped in comparison. We thought you may like to see a direct comparison so we took a photo of the two together with the Adonit Writer on top of the Logitech/Zagg case. The Logitech keyboard uses all but one of the function keys, adding Cut, Copy, Paste, Undo and Redo keys where Adonit have left them blank. Not essential by any means, but useful all the same. Adonit do include the more essential music transport controls, volume, mute, lock, home, search, slideshow and on-screen keyboard buttons. These all worked flawlessly with no delay. Seeing the two keyboards together we wondered if the fairly large bezel around the edge of the Writer's keyboard could be reduced to make more room for the keys? We realise it could affect the robust feel of the case but perhaps this would help open up the keyboard spacing. When you are on the move, quickly folding up the Adonit Writer is a cinch. The heft of the case with iPad in place can actually help weight it down in your hand whilst it is carried. The magnetic panel will keep the case closed if you carry it as shown in the photo above, with the keyboard closest to the palm of your hand. Hold it the other way round though, or especially horizontally and turn it over so that the flap faces towards the floor, and the weight of the keyboard will be too much for the magnet to hold and the flap will fall open. It is probably as secure in this regard as Apple's Smart Cover. This may not be an issue for you and it will depend on whether you put the Adonit Writer in your bag next to other items while in transit which could hook it open fairly easily. If you use a bag that has a dedicated pocket for your iPad, like the brilliant iPad Messenger Bag we reviewed a back in July, then this won't bother you at all. The Adonit Writer 2's Bluetooth keyboard is powered by 3xAAA batteries. These should provide you with many hours of usage as the Writer possesses power management features that shut off the keyboard when you close the lid or after a period of inactivity. Having to purchase replacement batteries is a pain and may or may not bother you. We know it is not very environmentally friendly to use replacement batteries and in our house the AAA batteries have a habit of disappearing into the kids' toys and appliance remotes before we have a chance to use them. On the whole though, we would prefer a built-in rechargeable battery. Remembering to charge built-in batteries is always a hassle, but at least if it runs out 3 hours into a flight or train/car journey there may be more chance of finding a power outlet to recharge from than a shop selling AAA batteries. It is obvious that a lot of thought has gone in to the Adonit Writer 2's design and we were impressed with the build quality and robust feel of the case and keyboard. With its multiple-angle positioning the Writer 2 will suit most situations where you need to use your iPad, as long as it is in the horizontal orientation. When you want to, you can very easily pop the iPad out of the case using the Quick Eject feature. You may have issues with the size of the keyboard and we have to be honest and say that we think it is too cramped and the keys are too close together. As we said earlier, we think it is a missed opportunity for Adonit to nail the built-in-Bluetooth-portfolio-iPad-case market. You may find otherwise, but even after a couple of weeks use we still felt the same way and it really disappointed us because we so wanted to unreservedly recommend it. As it is though, we still think the Adonit Writer 2 has many positive points and is one of the best designed cases, aside from the keyboard, that we have seen. Sadly, the keyboard is what we would be buying this case for, so we recommend you try it out first to see if it fits your hands and typing style. The Adonit Writer is available in two versions, for the original iPad at $79.99, and the version we reviewed for the iPad 2 at $99.99. Following this review we heard from Adonit that they are already in the process of updating the Writer keyboard with increased key spacing, based on previous customer feedback. The new version will have a keyboard experience "very similar to a MacBook Pro", which sounds promising. We hope to get a look at the new Writer soon and we'll let you know what we think. The super creative folks at Day of The Thread have recently launched a series of iPad covers. These beautful hand-crafted covers are a real treat and should prove to be a serious temptation to anyone looking to soften the cold industrial feel of the iPad. There are currently twenty different cover designs to choose from, each with its own unique look and feel. The range should appeal to a broad spectrum of iPad owners - there's something for everyone. These are simple cases, not a hash metal zip or an ugly plastic clip in sight! The iPad slides in from the top and fits snuggly and securely. The flap is fastened to the body of the case with a single centre button, it's all very neat. Sure the iPad has a great industrial design, but it's all a bit cold and inorganic. When in the case the iPad takes on a totally different feel - warm and natural. The capacious back pocket has enough room to store your phone, a set of earphones, some cables or a wallet with ease. We love these cases, they are different, practical and stylish, each one is a real work of art. Please be sure to check out our video review embedded above. For more information or to place an order head on over to Day of The Thread on Etsy, and don't forget to follow them on Twitter too. An over the shoulder iPad case, made especially with musicians in mind, attached to a guitar strap? It could be a reality if a new Kickstarter project gets off the ground. This video for the Trubadour iPad Case (very much a prototype at this stage) says it all and it could be yours if you pledge $40 or more. What do you think, is this a good idea? Here is a new Kickstarter project that may appeal to some and reminds us of the classic 'anglepoise' iMac. Hanfree (that's not a spelling mistake) has been designed "with the goal to create a new user experience for the iPad with an emphasis on comfort and fun." 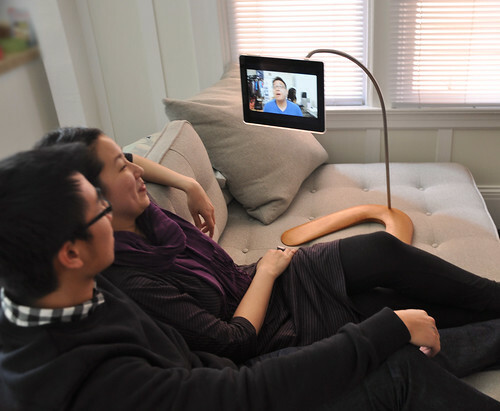 If you have watched the promotional video above you will know that the Hanfree is basically a stand for your iPad consisting of a base, an angled neck, and a case that allows you to position the iPad any way you like via a ball and socket joint. 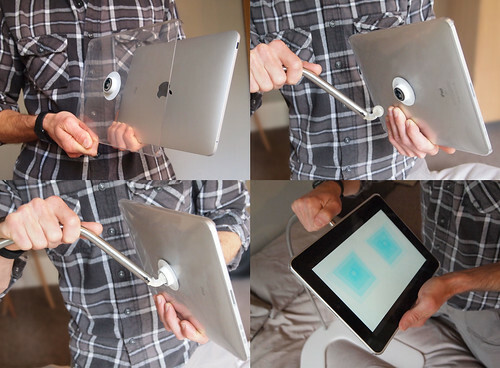 We think it looks like a fun and very useful iPad accessory. Imagine a guitarist using Amplitube or a sheet music/tab reader and the Hanfree when playing guitar for example. We can't be the only ones who find it a little awkward to hold the iPad when watching a video in bed (you do it too, admit it!) and the Hanfree base is specifically designed to tuck under pillows and suspend the iPad above or in front of you in that exact scenario. There are probably many more uses for the Hanfree when you start to think about and the $50 buy in price seems fairly reasonable. If it didn't cost another $40 to ship it to the UK (plus our ridiculous import charges this side of the pond), we would probably be ordering one right now. The project, as of writing, is just below its funding target, with 24 days to go, so we are sure this one will be in production soon enough. Be sure to check out the Kickstarter page for lots more photos plus info on the design and creative process that has gone into the Hanfree. What do you think? Have your ordered one? Let us know in the comments. These cases are not even out yet, but they are already causing quite a buzz in the iPad community. Perfect for blending in when you are staying at the Pantone Hotel, there are 4 iPad and 9 iPhone 4 Pantone approved coloured cases under their Pantone Universe brand in partnership with Monaco based Case Scenario. There are literally hundreds of designs on Zazzle's site that can be printed on to a special fabric backed Speck hard shell iPad case which provides access to all the controls and ports on your device. Most cases are around the $50 mark. You can browse by category or search for something specific and if you can't find it, then you can upload your own photo or image and make a truly custom case for your iPad. It didn't take us too long to upload our image and make this cover, to the point where it was ready to order. We quite like it! Still only available on pre-order at $149, the hopefully-not-vaporware iPad case from Crux that promises to be a movie stand, keyboard enabled workstation and all-round protector of your device, has a neat promotional video on the website which we have been watching over and over whilst hovering a finger over the 'pre-order now' button. Check out the video below and let us know if you hit that pre-order button, we want to know what you think when it finally arrives.